An estimated 2000 chemicals are being used as pesticides worldwide, including banned pesticides and other hazardous chemicals. In view of international food trade this large number implies that pesticide analysis should not be treated as target compounds analysis. Thus, current mass spectrometry instrument development is challenged to provide a one system and method that will be capable of analyzing as many pesticides as possible in full scan mode, in the needed instrumental sensitivity and selectivity in complex agricultural matrices, and in a short amount of time for effective (and lower cost) pesticides screening. In order to advance towards meeting the above challenges, a GC-MS with Cold EI (EI of Cold Molecules in Supersonic Molecular Beams) was evaluated in the past with pesticide analysis in agricultural products as described in M. Kochman, A. Gordin, P. Goldshlag, S. J. Lehotay and A. Amirav "Fast, High Sensitivity, Multi-Pesticide Analysis of Complex Mixtures with the Supersonic GC-MS" J. Chromatogr. A. 974, 185-212 (2002). Recently, we further evaluated pesticide analysis with the Aviv Analytical 5975-SMB GC-MS with Cold EI (GC-MS with supersonic molecular beam (SMB) interface and its fly through ion source) and developed a method to meet the above challenges. Keep reading to find out how the Aviv Analytical 5975-SMB GC-MS with Cold EI enables a truly universal method of pesticide analysis in agricultural matrices with improved range of compounds amenable for analysis, reduced matrix interference, lower LOD particularly for difficult to analyze pesticides, improved pesticide identification and shorter analysis time. In the 5975-SMB GC-MS with Cold EI, the GC eluting molecules are mixed with helium make up gas, expand from a supersonic nozzle into a vacuum chamber, vibrationally cooled, skimmed, collimated into a SMB, pass a fly-through electron ionization ion source where they are ionized by 70 eV electrons and mass analyzed. The use of short columns (i.e. 5 meters) and high column flow rates such as 8 ml/min lowers pesticides elution temperatures by over 100ºC, thereby enabling the elution of standard as well as thermally labile "LC pesticides", combined with the provision of enhanced molecular ions to all pesticides and fast analysis of under 10 minutes chromatography analysis time. We note that as explained below enhance molecular ions result in improved selectivity against matrix interference as well as better pesticide identification. In addition, the full elimination of ion source tailing (the analytes fly through the Cold EI ion source without ever touching it) results in uniform, compound independent response, thereby significantly lowering the LOD for difficult to analyze pesticides that are the bottleneck of current GC-MS analysis. Simultaneous full scan and time programmed SIM. The central feature of our method is the use of full scan together (simultaneously) with time programmed SIM for selected main targeted pesticides. SIM provides sufficient instrument sensitivity (better than MS-MS), and it can be time programmed the same as parent ions in MS-MS, while the full scan enables universal analysis hence should ensure against false negatives. Full scan can further serve for both library identification and for the provision of few more ions for additional confirmation in case of need (if sufficient instrument sensitivity is provided). More importantly, full scan can serve for reconstructed (RSIM) search of unlimited number of pesticides via their molecular ions and one additional isotopomer (same molecule, different elemental isotopes, such as M+1 etc.) and/or high mass fragment ion per pesticide. Accordingly, truly universal analysis is achieved. We note that suitable software for such multi RSIMs data analysis is provided by the Agilent Chemstation software and an improved version of it is the Agilent DRS software. On the other hand, the time programmed SIM on the molecular ions and their isotopomers (and/or one high mass fragment in case of need) provides the needed instrument sensitivity for trace level pesticide analysis (<10 ppb) while the method selectivity is largely increased on the molecular ions as discussed in details in our previous blog note and as briefly described below. Improved Selectivity against Matrix Interference. We found that matrix interference is exponentially reduced with mass at a rate of about twenty every 100 amu (J. Chromatog. A. 974, 185-212 (2002)). Thus, SIM on the molecular ion is about as selective against matrix interference as MS-MS on a fragment ion. Since most pesticides are analyzed by MS-MS on their major fragment ions as parent MS-MS ions in standard EI, we claim that the 5975-SMB GC-MS with Cold EI is as selective as GC-MS-MS with standard EI. In addition, the instrumental SIM sensitivity is superior to that of MS-MS since the later suffers from four types of signal losses compared to a single quadrupole MS in SIM mode: 1) Q3 losses of a factor of 3-4 with standard tune resolution; 2) CID losses due to dissociation to a few ion masses which is about x3 loss factor but sometimes much higher; 3) Q2 losses due to ineffective retaining of fast fragment ions; 4) Q2 collimation losses at the Q2 entrance and exit lenses which do not exist in a single quadruple instrument (about x2-3). In total, MS-MS suffers from about an order of magnitude lower daughter ions signal than SIM signal on the parent ions. Obviously MS-MS is sometimes operated on parent ions that are molecular ions and in that case it is more selective than SIM. However, these cases are usually with easy to analyze pesticides while the harder to analyze pesticides that represent the bottleneck of the analysis method are typically with weak or no molecular ion in their standard EI MS.
Extended range of pesticides amenable for analysis. The use of either PTV injector, or standard injector at a lower injector temperature with pulsed high flow rate splitless injection and the combination of short column, high column flow rate and the fly-through ion source of Cold EI enable the analysis of an extended range of pesticides including many of those that are considered difficult to analyze and those that currently require LC-MS for their analysis. No peak tailing. The full elimination of ion source peak tailing in the Cold EI fly-through ion source improves the signal of pesticides that are more difficult to analyze. Furthermore, the use of flow programming with very high flow rate at the end of the run serves to effectively clean the column from matrix residue hence to suppress column related peak tailing. Enhanced molecular ions and selectivity. The enhancement of the molecular ions in Cold EI in combination with the elimination of ion source peak tailing results in lower pesticides LOD, particularly for those pesticides that are difficult to analyze or that require LC-MS. Isotope ratio based identification. The ions that are selected for SIM for a given pesticide include the molecular ion and an additional one major isotopomer ion (such as M+1, M+2 etc.) and only if considered essential one additional high mass fragment. The use of our Tal-Aviv Molecule Identifier (TAMI) software provides a machine generated isotopomers ratio matching factors which in combination with having peaks with the same elution times results in effective sample identification. Fast screening analysis. The use of a short column and high column flow rate enables column temperature programming at 25ºC/min right from the start hence chromatography time of 10 minutes which is three times faster than commonly employed. If needed, even 50ºC/min can be used and at the end of the run the column flow rate is either reversed (back-flush) or increased to 30 ml/min for effective column cleaning from everything that was introduced into the column by the injector. Complementary method to LC-MS-MS. Currently, pesticides are analyzed by both GC-MS and LC-MS-MS. Since LC-MS is operated with a target based method of LC-MS-MS it is only logical that the GC-MS method will be universal with an instrument that can analyze extended range of pesticides and thus can also serve for the confirmation of LC-MS findings. As above, the use of time programmed SIM is at the heart of our method since it possesses a very important advantage over MS-MS in that it enables simultaneous full scan for obtaining universal pesticides analysis with minimal rate of false negatives via RSIM on the molecular ions of unlimited number of pesticides. While SIM can be operated simultaneously with full scan, MS-MS can not be operated simultaneously with full scan since the time required to remove the CID gas in Q2 is too long, and as a result, MS-MS must be operated as a target compounds oriented method. The above statements does not imply that MS-MS is not useful, it is very useful, and can serve to confirm pesticide findings after their screening to further remove false positives. Samples: Agricultural products extracts as commonly employed such as QuEChERS or another. Column: 5 m 0.25 mm ID, 0.25µ film of DB-5MS UI or equivalent. He column flow rate: 8 ml/min with flow program after 7 min (after the elution of the last to elute pesticide such as Deltamethrin or Prochloraz) to 30 ml/min at 22 ml/min.min. Injector liner: Standard 4 mm ID deactivated without glass wool to reduce its surface activity. Split ratio: Pulsed Splitless injection for 0.3 min at 50 PSIG (48 ml/min). Cold EI Ion Source: 12 mA emission, 700 mBar nozzle backing pressure, 60 ml/min total He flow rate (column plus make up at 250ºC transfer line temperature). SMB transferline temperature: 250ºC with temperature program of 10ºC/min after 5 min to 280ºC. Mass Spectral range: 50-550 amu at 2.9 Hz scan rate simultaneous (combined) with SIM of pre-selected molecular ions and their one isotopomers each at several elution time windows. The total SIM time was about as the full scan time. 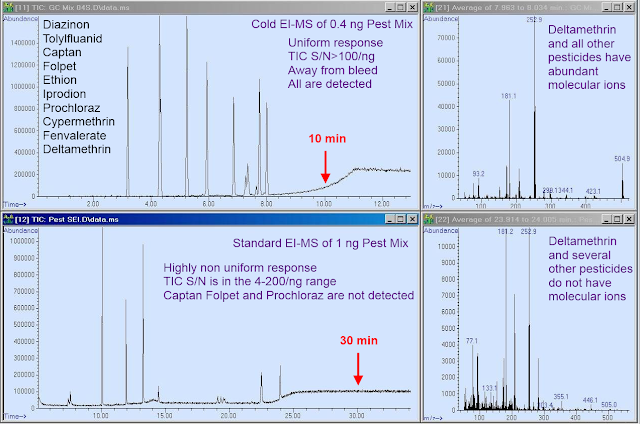 In Figure 1 we demonstrate our universal pesticide analysis method via the comparison of mass chromatograms of a pesticides mixture obtained by Cold EI (Aviv Analytical 5975-SMB) and Standard EI (Agilent 5973 MSD), and further comparison of a representative Cold EI and Standard EI mass spectra of the last to elute Deltamethrin pesticide. This data clearly demonstrates that Cold EI provides much more uniform response than standard EI, even for difficult to analyze pesticides that are as easy with Cold EI as standard pesticides. The pesticide names are given in the figure and note that three of the pesticides; Captan, Folpet and Prochloraz did not elute in standard GC-MS. These pesticides belong to the group of "LC-MS" pesticides while Captan and Foplet are difficult to analyze even by LC-MS. Thus, "the harder the pesticide analysis the greater is the Cold EI gain due to superior TIC S/N (x3-20) and enhanced molecular ion (~x5), as demonstrated for Deltamethrin. Finally the demonstrated analysis time with Cold EI is about three times faster than with standard EI. We note that a universal method is as good as its bottleneck compounds, thus, Cold EI is far better than Standard EI in pesticide analysis. In Figure 2 we extend the comparison to another GC-MS and pesticides mixture and now the standard GC-MS is a Shimadzu QP 2010 Plus system. 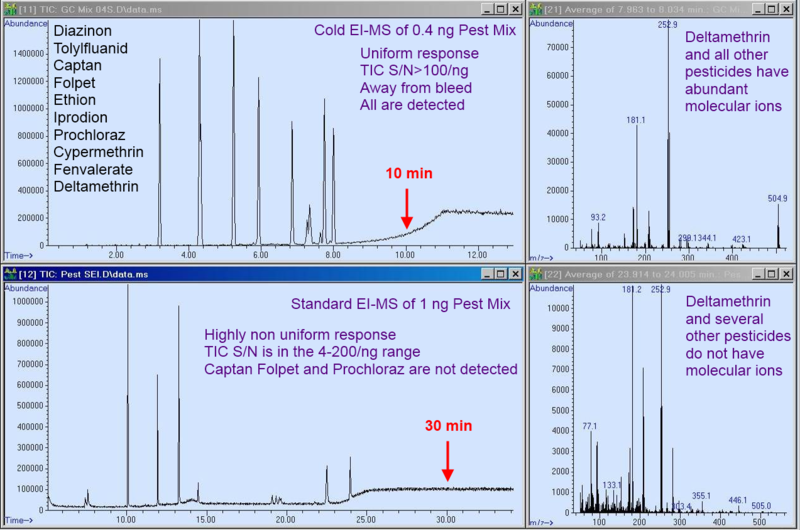 In Figure 2 we compare Cold EI and Standard EI mass chromatograms of nine pesticides mixtures at 1 ppm each, and representative Cold EI and standard EI mass spectra of a "difficult" to analyze pesticide Iprodion. The pesticides are listed according to their order of elution in the Cold EI. Note the availability of an enhanced molecular ion for Iprodion and the much better quality of its Cold EI mass spectrum. In addition, Figure 2 (the same as Figure 1) demonstrates much more uniform response of Cold EI for this mixture that includes a few "difficult to analyze" pesticides and over twice faster analysis. 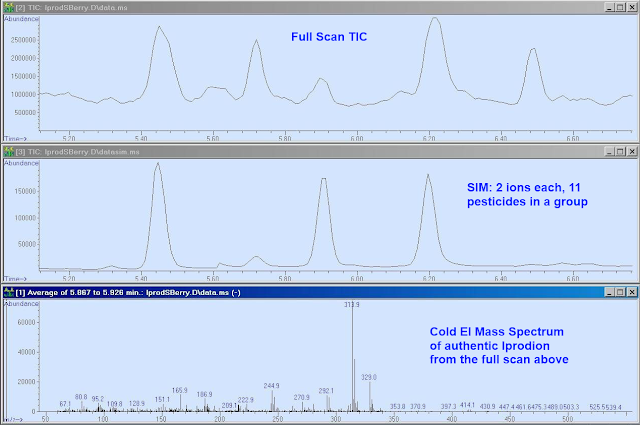 Both mass chromatograms are normalized to diazinon which is an "easy to analyze" pesticide. Figure 1. 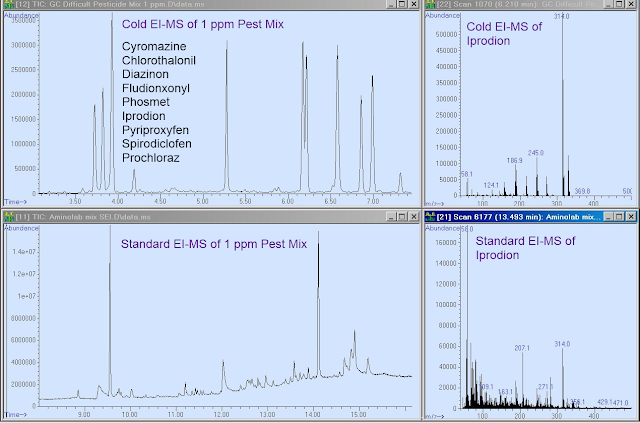 Mass chromatograms of pesticides mixtures and representative Cold EI and Standard EI mass spectra of the last to elute Deltamethrin pesticide. The pesticides are listed in order of their elution while Tolylfluanid, Captan and Folpet nearly co-elute at the second broader peak in Cold EI and Cypermethrin is represented by its few isomers. Note the availability of an enhanced molecular ion for Deltamethrin, and the much more uniform response of Cold EI even for difficult to analyze pesticides and its about three times faster analysis. 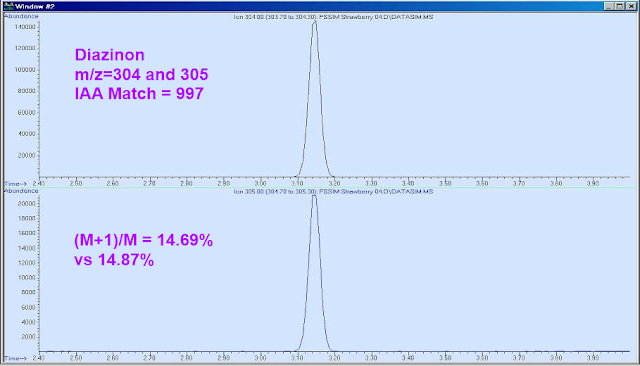 Both mass chromatograms are normalized to diazinon which is an "easy to analyze" pesticide. 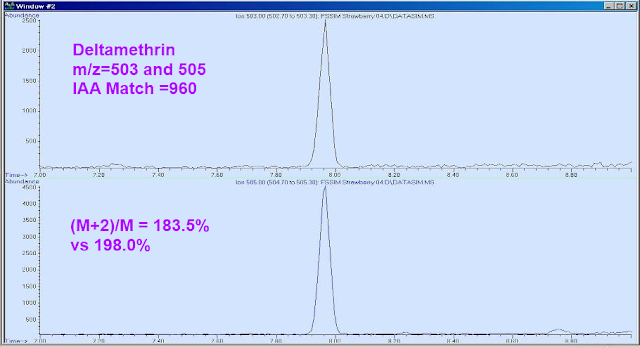 Cold EI was obtained with the Aviv Analytical 5975-SMB while standard EI was obtained with an Agilent 5973 MSD GC-MS using "standard" analysis conditions. Figure 2. 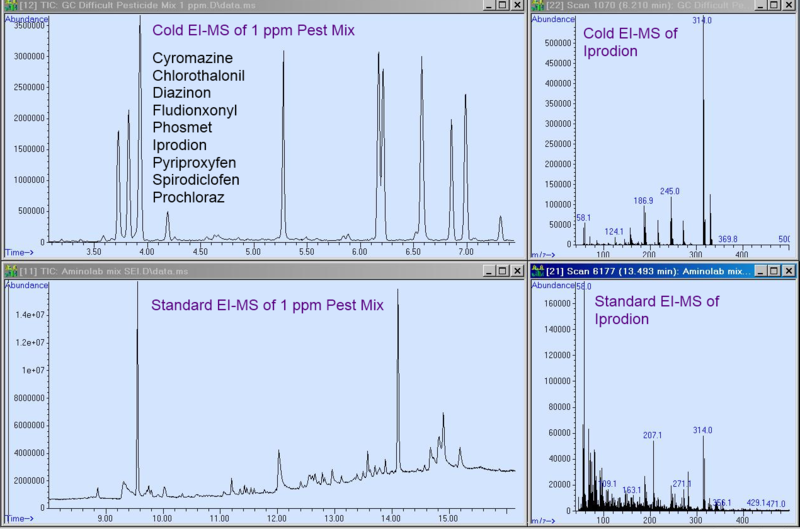 Mass chromatograms of nine pesticides mixtures at 1 ppm each, and representative Cold EI and Standard EI mass spectra of the "difficult" to analyze pesticide Iprodion. The pesticides are listed according to their order of elution in the Cold EI. Note the availability of an enhanced molecular ion for Iprodion which is missing in standard EI and the much better quality of the Cold EI mass spectrum. In addition, much more uniform response of Cold EI is observed for this mixture that includes a few "difficult to analyze" pesticides and over twice faster analysis. 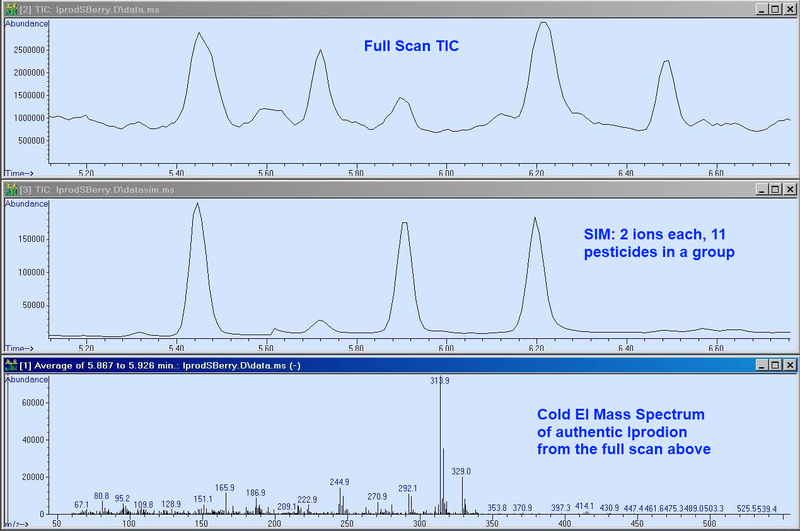 Both mass chromatograms are normalized to diazinon which is an "easy to analyze" pesticide. Cold EI was obtained with the Aviv Analytical 5975-SMB while standard EI was obtained with a Shimadzu QP2010 Plus GC-MS.
We evaluated the relative sensitivity and limits of detection of the 5975-SMB GC-MS with Cold EI. We found that for easy to analyze pesticides such as diazinon the TIC peak signal to noise ratio is about the same in both systems. However, in RSIM on the molecular ion which is the most selective ion in the MS Cold EI benefits from enhanced molecular ion which for diazinon is a factor of 4.2. As the pesticide becomes harder to analyze the Cold EI sensitivity gain is increased due to its uniform response. An example can be seen in Figure 3 below, in which we compare the analysis of Prochloraz with the 5975-SMB and a Shimadzu QP 2010 Plus system. For a "fare" comparison we did not use the molecular ion m/z=375.1 as it was fully missing in Standard EI (unlike in Cold EI). However, as shown, the Prochloraz RSIM trace on its high mass fragment m/z=308 badly tails in standard EI and as a results it lost about a factor of 7.5 in its TIC signal compared with Cold EI. The software calculated S/N (after file conversion of the Shimadzu data file into Chemstation file (using the MASSTransit file conversion software) showed that Cold EI was superior to Standard EI by a factor of over 20 as the noise level in Cold EI was very low. Figure 3. 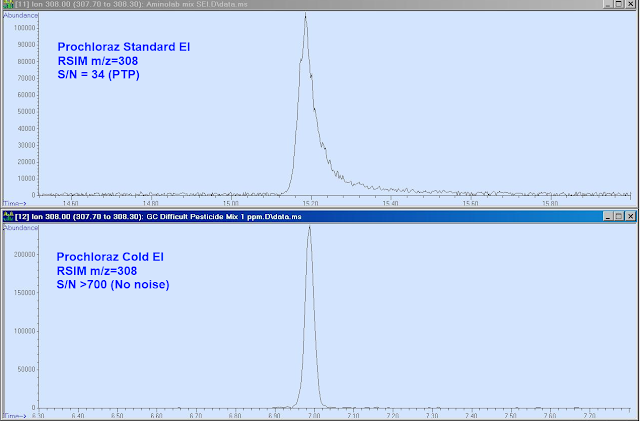 A comparison of Standard EI (upper trace) and Cold EI (bottom trace) reconstructed mass chromatograms on m/z=308 which is the major high mass fragment of Prochloraz (1 ppm standard). Note the markedly superior S/N in the Cold EI RSIM. At the molecular ion m/z=375.1 there is no signal in standard EI while the Cold EI peak is clean from any noise. Note that the standard EI peak shape is tailing while in Cold EI it is fully symmetric. In Cold EI ion source peak tailing is fully eliminated in the fly-through ion source, in contrast to standard EI. In addition, column related peak tailing is also reduced in Cold EI via the use of short column with flow program to 24 ml/min at the end of the run for effective cleaning of the column from low volatility matrix residues. Cold EI was obtained with the Aviv Analytical 5975-SMB while standard EI was obtained with a Shimadzu QP2010 Plus GC-MS system. Another important topic in pesticide analysis is pesticide identification which is discussed by several literature papers. Our approach is to identify the pesticides in their screening via isotope abundance analysis (IAA) in time programmed SIM on the molecular ions and one of its isotopomers. Figure 4 demonstrates the effectiveness of IAA in the case of diazinon and deltamethrin at the level of 80 ng/g in strawberry extract. 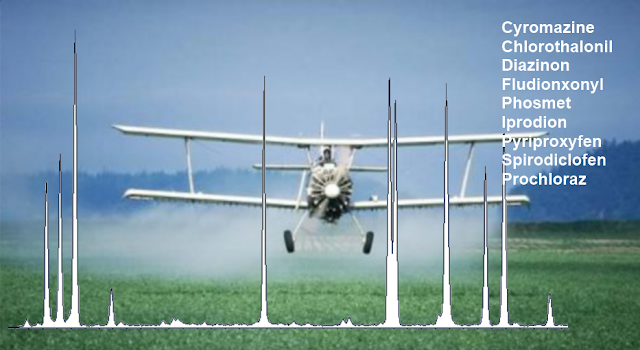 Unlike other methods, IAA provides objective, machine generated matching factors which if above 800 (a match of 1000 indicates a perfect match) can serve for pesticide identification in addition to the pesticide elution times, the co-elution of the two isotopomers SIM traces and attempted library identification via the simultaneous full scan. Figure 4. Isotope abundance analysis (IAA) for the identification of pesticides in time programmed SIM on the molecular ions and their major isotopomers (with Cold EI). The figure demonstrates the effectiveness of IAA in the case of diazinon and deltamethrin at the level of 80 ng/g in strawberry extract. Note also the effectiveness of the molecular ion in matrix interference reduction. The minor noise at the deltamethrin m/z=503 trace is from column bleed. Unlike other methods, IAA provides objective, machine generated matching factors, which if above 800 (out of 1000) can serve for pesticide identification in addition to attempted library identification via the simultaneous full scan. The inserts also include the experimental isotope ratios versus their theoretical values. Finally, in Figure 5 we further demonstrate the effectiveness of our method in the analysis of an incurred difficult to analyze pesticide such as Iprodion in Strawberry at ~70 ng/g concentration with the 5975-SMB GC-MS with Cold EI, in simultaneous full scan and two ions SIM mode. This Iprodion residue was undetected by standard GC-MS. Note the very high S/N in the SIM trace of 11 pesticides (22 ions in the group). In the SIM trace on either the isolated molecular ion m/z-329 or high mass fragment m/z=314 the RSIM trace was clean. Furthermore, while Iprodion was not identified by the NIST library due to matrix interference, IAA with the TAMI software provided a matching factor of 961 (in the full scan) thus Iprodion was positively identified. Figure 5. The analysis of authentic Iprodione in Strawberry at ~70 ng/g with the 5975-SMB GC-MS with Cold EI in simultaneous full scan and two ions SIM mode. This data serves to demonstrate the effectiveness of our method in a real case of authentic Iprodion residue which was undetected (false negative) by standard GC-MS.